Condensed from Philadelphia Green News, a publication of the Pennsylvania Horticultural Society, July/August 1999. When we think of housing developments, we tend to think of overcrowded high-rises with a limited landscape. But Philadelphia Green (PG), which is a program of the Pennsylvania Horticultural Society, and the Association of Puerto Ricans on the March (APM) set out to change the way residents of subsidized housing view their living spaces and neighborhoods. Jardines (pronounced har-DEEN-nis, it means "garden" in Spanish) is a model of the positive impact greening can have on communities regardless of their economic status. For many years, the grounds of Jardines (located at 6th and Diamond Streets) were in disrepair. Residents struggled with maintaining the property from outside vandalism; plants were often trampled on and even stolen. It was not until PG teamed up with APM and the community that things started to change for the better. 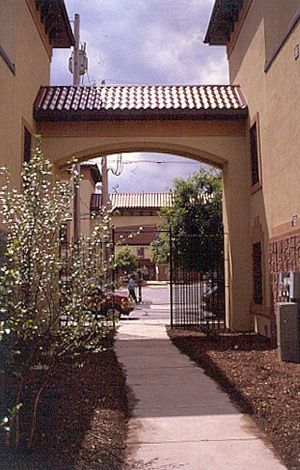 PG began work on Jardines in 1998. PG staffer Mark Huber drew up a landscape plan for the common areas, surveyed residents, and came up with a cost analysis of the plantings. A landscape contractor was hired to do the cost estimate for the entire re-landscaping project. Other PG staffers set up a design workshop in which residents could decide how they wanted their backyards to look and which shrubs and perennials to use. Carl Haefer gave a demonstration on proper planting techniques. On the day of the planting, residents, community volunteers, and young people came out to show their support, determination, and commitment to the project. "We saw great potential with Jardines," said Debbie Hall, a PG project manager. "We wanted to make an impact not only in terms of aesthetics, but also on the attitudes of the residents. We went door to door, to ask each one of them what plants and trees they wanted. In doing so, we gave them a voice and got them interested in their community. Without the community's involvement, this project would not have been successful." It was agreed that APM would take care of the trees planted in the common areas, while PG would help with plantings in the front- and backyards.Work began in mid-April. In one week's time, residents and volunteers (including Patricia Sims, Margarita Gonzalez, Maria Torrens, and John and Betty Nieves), working alongside APM and PG staff members, planted sawtooth oak, river birch, and hackberry trees. They rototilled the soil, mulched beds, planted shrubs and perennials, and filled frontyard barrels with lush greenery. Before long, Jardines was looking more like lush suburbia than a city housing development. And in a show of commitment, APM has recently hired a landscape maintenance person to manage and oversee the newly planted common areas, and to work closely with PG and the tenants. "Our partnership with Philadelphia Green is necessary to bring relief to an urban environment," said Rose Gray, Director of Housing at APM. "In the past, we would just build, build, and build on vacant land to get rid of these eyesores, but we soon learned that greening can do so much more. The Jardines project is one shining example. Through greening, people in this community now feel safer and have a greater sense of home. And with PG's horticultural expertise, we'll be able to maintain all of the work that's been done for years to come." Marcus Vidal, APM property manager, could not be more pleased about the change. "The work being done in the complex really got everyone excited, and it has brought them closer together. Not only does everything look nice, but people want to keep it that way, too. Even the children are more careful of the gardens and have become very protective of them." "It doesn't stop with Jardines, though," PG project manager Don Holub added optimistically. "We want this relationship to continue and grow to include other positive changes in the community, including youth environmental programs, creating greenways, and beautifying other housing developments. In the end, it is all about the power of building partnerships with community development corporations such as APM, getting residents involved, restoring pride in their community, and overall, trying to improve people's lives."